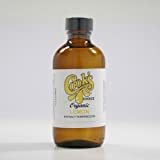 Cook's Organic Pure Lemon Extract 4oz. 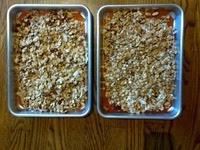 Optional ingredients: ½ teaspoon ground flax seeds or sesame seeds. Hint: If you use the same measuring cup for olive oil, maple syrup and honey, measure and add the olive oil first, then the other two ingredients will slip right out of the measuring cup without any residue. Baked at 325 for 25-30 minutes. Time varies with oven. There is a fine line between just done and burned. 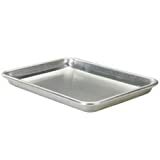 You will quickly figure out how long you have to bake in your oven. Real (not imitation) maple extract is hard to find in local stores. 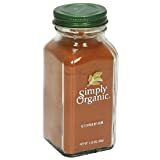 Amazon carried Olive Nation brand real maple extract. I prefer to omit if I don’t have the real stuff. I buy the sliced almonds or walnuts at Costco. I break up the walnut by putting in a freezer bag, squeeze out air, and then break up by hitting with a rolling pin. 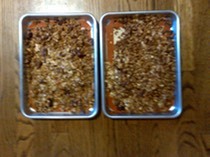 I keep all dry ingredients, except for oats, in the freezer. 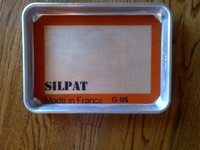 Push granola to center of Silpat.